Marks permanently on nearly any surface like glass, wood, metal, photos, plastic, cellophane and more. 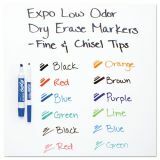 EXPO Low-Odor Dry Erase Marker, Eraser & Cleaner Kit, Assorted Tips, Assorted, 12/ST - Durable storage case contains everything needed for effective, colorful presentations. With better erasing ink, one swipe of the eraser and it's gone. 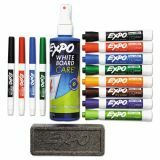 Expo low-odor kit contains four low-odor fine point markers and eight low-odor chisel tip markers, one Expo eraser and one 8 oz. 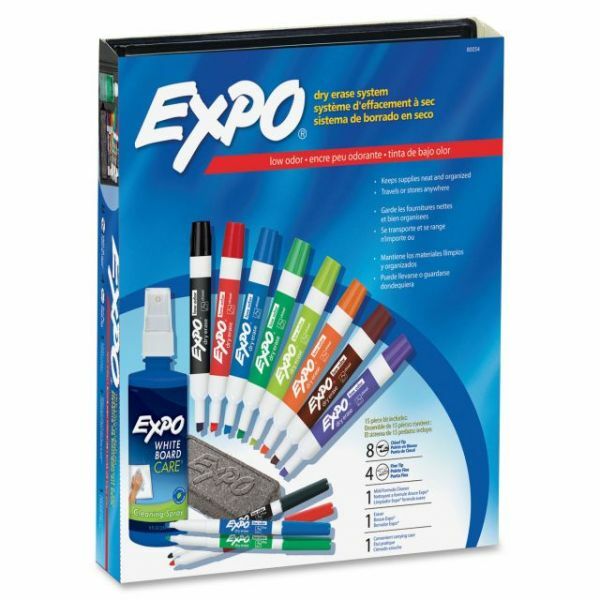 bottle of Expo low-odor cleaner. 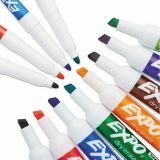 Fine point markers include black, blue, red and green. Chisel tip markers include black, blue, red, green, yellow, orange, brown and purple. 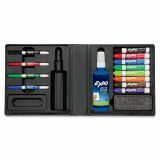 Includes four low-odor fine-point and eight chisel-tip markers. 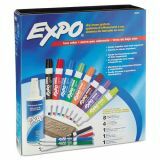 Features Expo eraser and 8 oz. bottle of Expo low-odor cleaner.